Map from Austin Rail Now/Our Rail leaflet distributed at July 26th “Traffic Jam” shows 21-mile light rail transit line proposed as a “high-capacity transit” alternative to the “BRT” line in I-35 advocated by TxDOT and other road proponents. 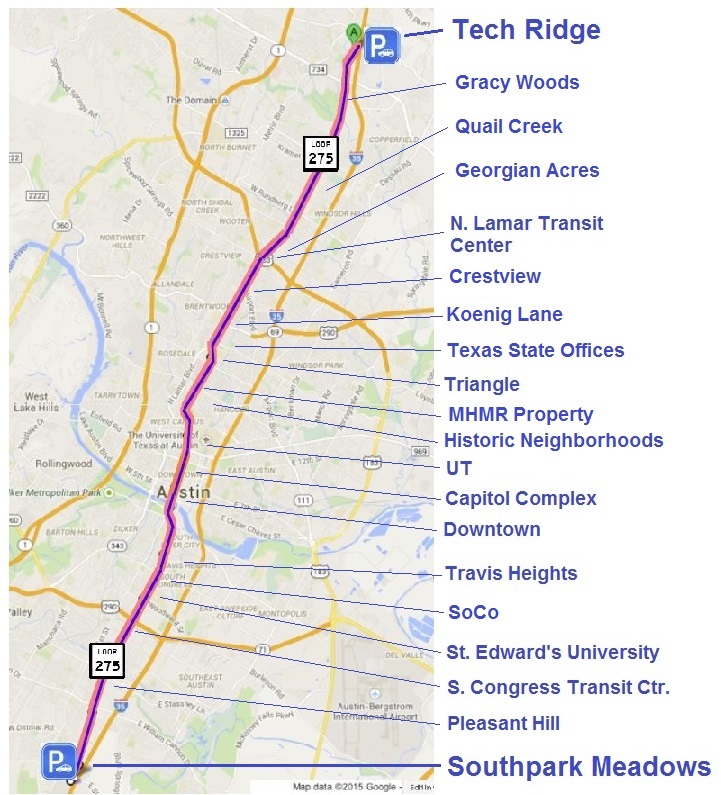 As our April 30th article «Reorganized Project Connect 2.0 opens up, reaches out» explained, Project Connect – the major planning effort -sponsored by Capital Metro, has been re-evaluating Austin-area corridors as possible candidates for rail and other forms of “high-capacity transit”. In recent months, the Texas Department of Transportation (seeking funding participation for its planned overhaul of Interstate Highway 35 through Austin) has been prodding the transit agency to allocate funding for a so-called “bus rapid transit” (BRT) service to be installed in the proposed reconstructed highway. This has become one of the de facto “high-capacity transit” alternatives competing with urban rail in the Guadalupe-Lamar corridor for major local funding. On July 26th, Project Connect, Capital Metro, and several other collaborating agencies sponsored a “Traffic Jam” community meeting, with invited panelists, to discuss possible options in the planning process. 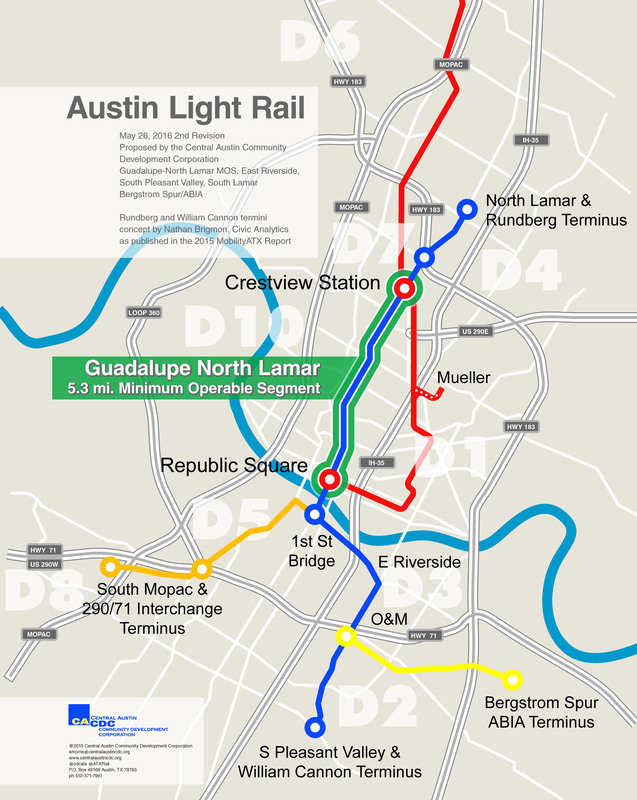 The following article is adapted from a leaflet published and distributed by Austin Rail Now, together with the Our Rail political action committee, at the “Traffic Jam” meeting, focusing on a proposed central 21-mile light rail transit (LRT) project, paralleling I-35 and Loop 1 (“MoPac”, Austin’s other north-south freeway), as an alternative to the I-35 “BRT” proposal. Why not a true mobility option? 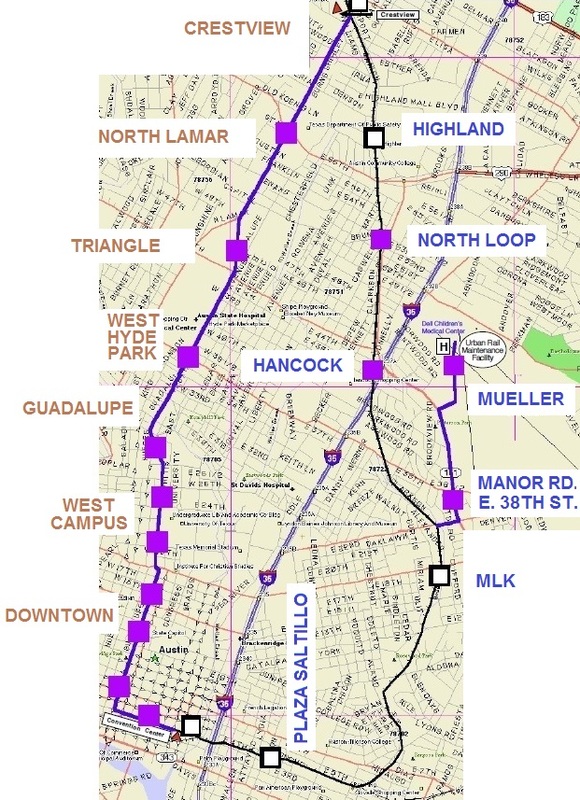 • Alternative to I-35 and Loop 1 — A 21-mile urban rail line, running from Tech Ridge in the north to Southpark Meadows in the south, following the Loop 275 (North Lamar to South Congress) corridor, could provide alternative traffic relief to Austin’s major north-south freeways (I-35 and Loop1/MoPac). Map at left illustrates the major neighborhoods and activity centers that would be served. Such a route could plausibly have a potential of attracting ridership of 100,000 a day. • Better option than I-35 “BRT” — Urban rail is a far better public transit option than a dubious, seriously handicapped “bus rapid transit” (BRT) line in I-35. Urban rail lines have demonstrated significantly greater potential to attract riders, guide adjacent development, improve commercial taxbase, and stimulate economic activity. It’s unlikely that buses running in an I-35 HOV toll lane would yield any of these benefits. • Affordable — Light rail transit (LRT), predominantly surface-routed, can most easily and affordably be installed to serve people where they live, work, and need to go. Decades of experience in other major U.S. cities demonstrates that light rail is substantially less costly to operate per passenger-mile than buses, and tends to create high-value taxbase around stops. This can significantly enhance public revenue for better city services, while at the same time helping stabilize or even lower property taxes. • Guadalupe-Lamar starter line — Guadalupe-Lamar (G-L) is the center city’s 3rd-heaviest north-south corridor. In addition to major activity centers, the corridor serves a variety of dense, established neighborhoods, including the West Campus with the 3rd-highest population density in Texas. With Austin’s highest total employment density on Guadalupe-Lamar, an urban rail line could serve 31% of all Austin jobs. 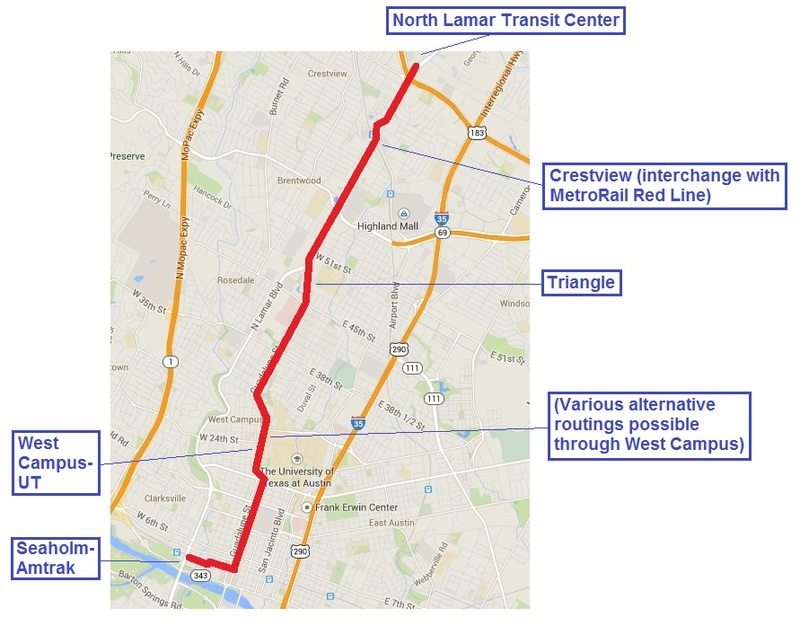 An initial 6 or 7 mile LRT starter line from U.S. 183 or Crestview to downtown could serve as the initial spine of an eventual metrowide system, with branches north and south, northwest, northeast, east, southeast, west, and southwest. • BRT Reality Check — So-called “BRT” operations in other cities like Minneapolis and Cleveland typically fail to meet the ridership and urban benefit claims of their promoters. Minneapolis’s Orange Line, an upgrade of the city’s heaviest bus transit corridor in I-35W, with just 14,000 daily ridership on 25 routes after 45 years’ worth of facility investment, is no model for Austin. (In contrast, Minneapolis’s 2 LRT lines attract ridership of 68,000.) Cleveland’s Health Line carries ridership of 16,000 in the city’s historically busiest local corridor. Running both in reserved lanes and in mixed traffic, this line is more akin to Austin’s MetroRapid bus services than a “BRT” operation in I-35. • Community benefits — Compared with buses, LRT systems are more user-friendly, more comfortable to access and ride, and more reliable. G-L LRT would provide higher passenger capacity than the proposed I-35 “BRT”, while being more energy efficient, encouraging denser development and safer, more livable urban environments, and emitting less greenhouse gases. In downtown Minneapolis, two light rail trains pass on 5th St., a major east-west thoroughfare with dedicated lanes for light rail. Photo: L. Henry. Last month, the 13th National Light Rail Conference, co-sponsored by the American Public Transportation Association (APTA) and U.S. Transportation Research Board (TRB), was held in Minneapolis, whose initial light rail transit (LRT) starter line has been operating since 2004 (see «Minneapolis-St. Paul (Twin Cities) Public Transport»). Attending the conference were two contributors to Austin Rail Now, Dave Dobbs and Lyndon Henry. Minneapolis’s LRT system has been a spectacular success — particularly by exceeding ridership projections and providing more efficient and cost-effective transit service through lowering the average operating and maintenance (O&M) cost of urban transit per passenger-mile. Add to that the significant improvement of urban mobility and livability. This has convinced local policymakers and planners that further investment and expansion of the system are justified, leading to the opening of a second route, crossing the Mississippi River and connecting the Twin Cities of Minneapolis and St. Paul, Minnesota, in 2014. Additional routes are now in development, and the Northstar Line, a regional passenger rail (commuter) line serving northwest suburbs and exurban communities, was also launched in 2009. See: «Minneapolis Area: Northstar Regional Rail Links Northwest Communities With Central City». Overall, the Minneapolis LRT system appears to be a highly appropriate model for other cities — and especially Austin, where community support has been growing for an LRT starter line project in the Guadalupe-Lamar corridor (Guadalupe St.-North Lamar Blvd.). (See «Plan for galvanizing Austin’s public transport development: Light rail starter line in Guadalupe-Lamar».) As with Minneapolis’s original starter line, Austin’s Guadalupe-Lamar LRT line could serve as the trunk or spine for additional lines branching out into other segments of the urban area. This article/photo-essay presents a brief summary description of the Minneapolis LRT system and focuses especially on particular features that highlight why LRT is such an exceptionally appropriate and desirable public transport mode for a city like Austin. So far, the Twin Cities LRT system extends approximately 23 miles, mainly south and east of central Minneapolis, as illustrated in the map below. ► Blue Line — Originally dubbed the Hiawatha Line because much of its alignment uses a former railroad right-of-way (ROW) paralleling the city’s Hiawatha Avenue, the initial route (opened 2004) is now designated the Blue Line. Extended slightly, it now stretches about 12 miles south from the city’s downtown to the airport and terminates at the Mall of America. In the CBD, generally from the Downtown East station west, the Blue Line runs in dedicated lanes within 5th Street — in effect, a quasi-transit-mall configuration with some access allocated to motor vehicles (see photo at top of post). ► Green Line — Also called the Central Line, this 11-mile route (opened 2014) crosses the Mississippi River to link the downtowns of Minneapolis and St. Paul. It also re-establishes what was once the Twin Cities’ formerly busiest streetcar route, part of the region’s vast, efficient electric rail system destroyed in the 1950s amidst the widespread national Transit Devastation, when public policy eliminated urban and interurban electric railways in a disastrous effort to encourage (and coerce) the American population to rely exclusively on personal automobiles and other rubber-tired transport (buses) rather than urban and interurban electric rail for mobility. In contrast to the Blue Line, the Green Line is routed almost entirely via dedicated lanes or reservations within major arterials and other thoroughfares, with a particularly long stretch along University Avenue west of the Mississippi and toward St. Paul. In the Minneapolis CBD, the Green Line shares dedicated tracks on 5th St. with the Blue Line. Also of note is the use of the iconic Washington Avenue bridge (retrofitted to accommodate LRT) to cross the Mississippi River, as discussed further below. Green Line alignment in median of University Avenue. Photo: L. Henry. ► Joint use of 5th St. trunk line — As mentioned above, both the Blue and Green Lines share tracks of the original 5th St. trunk route in downtown Minneapolis. A section of this alignment is illustrated in the photo at the top of this post. The following photo shows one of the stations in this alignment. Passengers awaiting arrival of Green Line train at downtown Warehouse District/Hennepin Avenue station in 5th St. alignment. Photo: L. Henry. Passenger purchases ticket from TVM at downtown station. Photo: L. Henry. LRT can provide a cost-effective way to implement rail access to a city’s major local airport. However, typically the heaviest airport ridership tends to come from employees rather than passengers, so to be cost-effective the LRT route must also serve other significant sources of ridership close by (exemplified by LRT routes to airports in Baltimore, St. Louis, Portland, Phoenix, Seattle, Dallas, and Salt Lake City). Minneapolis’s Blue Line LRT strongly fulfills this requirement, since its airport stations are situated in the middle of good traffic generators on both sides (between the CBD on the north end and the Mall of America on the south end, with other activity centers and residential areas also in between). From visual observation, it’s clear that lots of passengers and airline crews utilize the convenience of the LRT connection. Blue Line train arriving at Airport Humphrey Terminal station. Photo: L. Henry. Lots of visible baggage on Blue Line train gives an indication that LRT service to Minneapolis’s airport is well-used by air passengers. Photo: L. Henry. Traveler with baggage boards Blue Line train at downtown station. With level boarding (station platform level with car floor), carrying on luggage is easy. Photo: L. Henry. Access to shopping malls is a major advantage for any rail transit line, and a huge convenience for the public (especially out-of-town visitors). The Minneapolis LRT system provides access to malls in both Bloomington (south of Minneapolis) and St. Paul. Blue Line train leaves the Mall of America station located in the parking garage of this giant mall, which hosts the most mall visitors in the world and is a popular tourist destination. Photo: Ymtram.mashke.org. Green Line’s Hamline station accesses major mall on University Ave. at West/Hamline Ave., with two “big box” stores (Walmart and Target). Photo: L. Henry. In Austin, ARN and other groups have advocated retrofitting either the Congress Avenue or South First (Drake) bridge to cross Lady Bird Lake (Colorado River) and link South Austin to the rest of the city on the north side of the river. We suggest this would be far more financially accessible and cost-effective than the expense of a totally new, specially constructed bridge. Green Line train crosses over Mississippi River on newly retrofitted Washington Ave. bridge. Photo: Streets.mn. Somewhat like Austin’s MetroRail alignment along Airport Blvd., the Minneapolis Blue Line along Hiawatha Avenue encounters design challenges at intersections, especially where these approach at an angle. How these problems have been dealt with may suggest some traffic solutions in Austin with respect to a potential intersection of road traffic with a proposed Guadalupe-Lamar LRT at Airport/North Lamar. In this Google Earth view, Hiawatha Ave., with the LRT line paralleling it on its western edge, runs diagonally north-south through the center of the photo. The 38th St. LRT station can also be seen, while E. 38th St. crosses both LRT line and Hiawatha Ave. east-west, in the bottom third of the graphic. Note that Hiawatha and the LRT line intersect E. 38th St. at about a 60-degree angle, somewhat similarly to Airport Blvd and N. Lamar and the MetroRail Red Line in Austin. Photo: ARN, from Google Earth. From a surface view, this shows the intersection protected with crossing gates. Photo: ARN, from Google Street View. With typically spacious vehicles, LRT has the advantage of accommodating onboard bicycles, in contrast with the constrained interior space of buses, which usually require cyclists to place their bikes on an outside rack (if one is available). These views show how bikes are accommodated aboard Twin Cities LRT trains. Bikes can be hung on special racks inside the LRT cars. Photo: L. Henry. In some cases, smaller bikes are simply held by the passenger. Photo: L. Henry. Level boarding, spacious interiors, and smooth ride qualities mean that LRT cars are exceptional in their ability to accommodate disabled, wheelchair-using, and other mobility challenged passengers. This also means that long delays in boarding wheelchairs, typical of buses, are eliminated, thus speeding transit service for all. Passenger in wheelchair boards train at downtown station. Photo: L. Henry. Passenger in wheelchair easily maneuvers chair into accessible space aboard car. In contrast to buses — no tiedowns, no operator assistance needed, no passengers ousted from their seats! Photo: L. Henry. Blue Line train approaches station along Hiawatha Avenue alignment. Photo: L. Henry. Minneapolis-area community meeting on proposed Southwest light rail project. Photo: Karen Boros. While Project Connect has been doubling down in its determination to squelch true public involvement (and substituting a process of rigidly controlled public manipulation portrayed as “community input”), a recent community meeting in the Minneapolis area gives an idea of what bona fide public involvement should look like (see lead photo, above). The focus was the Southwest Light Rail Transit plan proposed by Minneapolis’s Metropolitan Council. About 14 miles long, connecting downtown Minneapolis and St. Paul with the suburban community of Eden Prairie, the line would be (after the Central Corridor project now under way) the next major extension of the metro area’s highly successful Hiawatha light rail line (named after a major highway corridor it uses for much of its route). 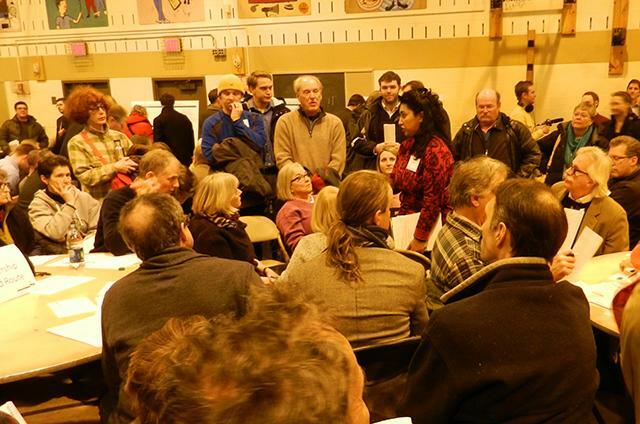 On January 8th, as reported by an article in the mostly online MinnPost, over 200 people filled the gym of a large recreation center (as shown above) to discuss and debate the project. Unlike Project Connect’s charade of “public participation” (where “meetings” consist of either personal one-on-one conversations with official representatives, or “opportunities” to approve predetermined choices with clickers), the Minneapolis event provides an example of a real community meeting, where participants were actually able to ask questions, voice comments, raise alternative approaches, and maybe come up with ideas and options the official planners hadn’t considered. That’s the kind of robust community involvement process that in the past was typical here in Austin, until roughly a decade ago. Project Connect, keeping its advisory committees in a kind of bell jar, and keeping itself in a virtual underground bunker, isolated from authentic public oversight, has been making extremely dubious decisions — including rigging a phony “Central Corridor” plan for “high-capacity transit” based in part on fantasy data. In continuing to isolate and insulate itself from bona fide community involvement and oversight, it’s highly likely that Project Connect will continue to fashion plans that ignore authentic community needs, misplace resources, and squander taxpayers’ money. Provoking public disgust and anger — even among strong public transportation supporters — is surely not a prudent strategy for building a voting constituency for major rail transit projects. “Stakeholders” cannot feel they have much “stake” when they’re excluded and manipulated. Will some members within Austin’s civic leadership have the strength and fortitude to recognize this, and demand an open, fully democratic, and authentic community involvement process? Revision: 2014/01/12 — The second paragraph of this posting has been revised to clarify information about Minneapolis’s proposed Southwest light rail project.